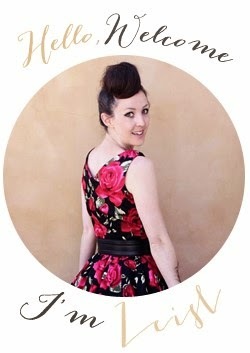 Summertime, and the living is eeeeeaaasy... actually no - it's already darn hot, so what better time to do a shirred dress tutorial for you all than now, hey? 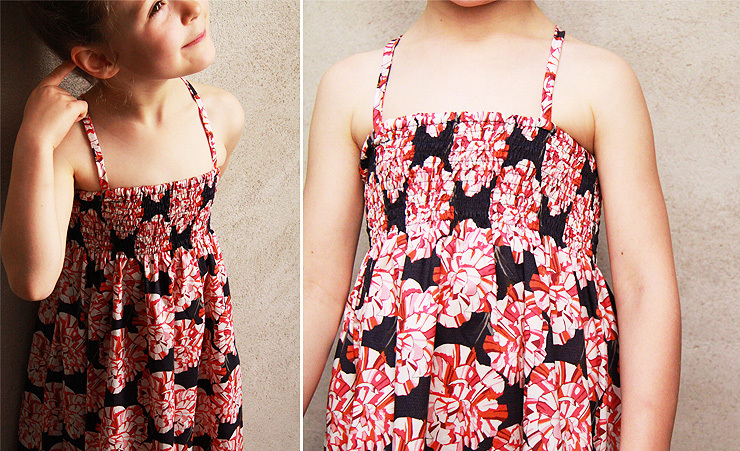 This dress is super simple to whip up. You won't even need a pattern, just a measuring tape and some lovely fabric. So let's get measuring, and get ready to sew! 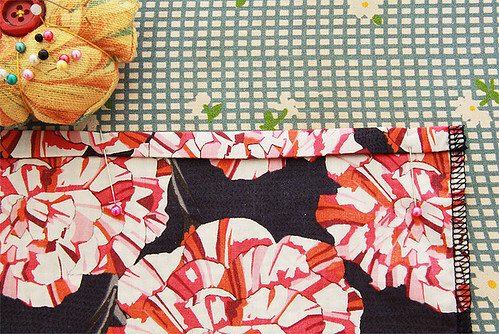 For the record, I used a Liberty Tana Lawn from Tessuti Fabrics that I had hiding away in my stash. Firstly you need to measure how much fabric you will need. I measured around Grumble's torso, and then multiplied that measurement by two plus seam allowances to get the total width of the dress. The shirred part will stretch over to fit the bust nicely, without feeling too tight. Firstly you'll need to figure out your torso measurement, and then double that, then add seam allowances. For example, Grumbles had a torso measurement of 68cm. Multiplying that by two gives you 136cm. Adding seam allowances of 2cm to each side makes it 140cm. You'll be cutting out a front and a back, so divide that figure by two to get the width of each piece. In this case it is 70cm. I decided that I wanted the dress to be mid-calf in length, so measured Grumbles once more. The resulting measurement was 65cm, from top of bust line to mid-calf. Adding 5cm for seam and casing allowances gave me a final figure of 70cm. So my final pattern piece for both front and back was 70cm wide and 70cm long. Once you've figured yours out, cut two of these. Hooray! The maths part is over. Let's move on to some actual sewing! 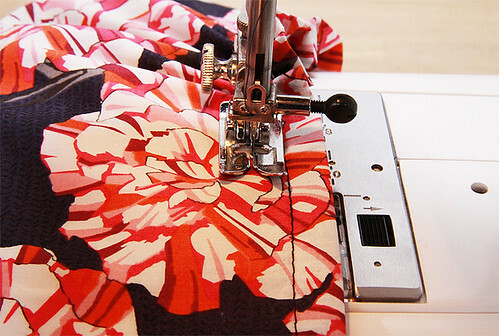 Once you have cut out your pattern pieces, overlock or finish all edges. 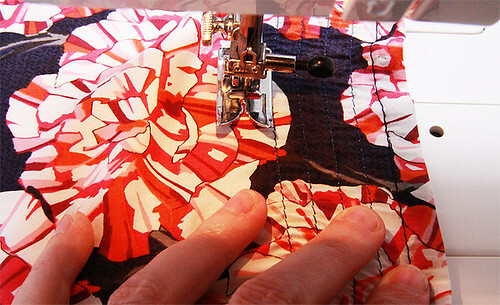 Sew one side seam together, leaving the other side seam open. Create the casing for the elastic. On the wrong side turn over the overlocked edge and press, then turn over again to create a 1.3cm wide casing. Press. Stitch the casing close to the edge. Oh, and try not to laugh at my daggy ironing board. Before you begin to shirr, you'll need to have changed your normal bobbin for one that has been tightly wound with elastic thread. If the elastic thread isn't tightly wound onto the bobbin, then the elasticised effect will not occur. It's easiest to do this by hand, stretching tight the thread as you wind it onto the bobbin. Now let the shirring begin! On the right side stitch a foot width away from the casing stitching. 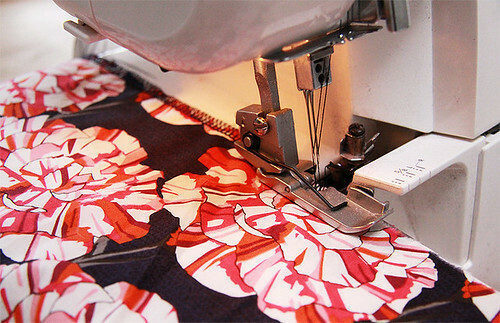 As you sew the elastic will cause the shirred part to bunch up behind your machine foot. It's pretty exciting! 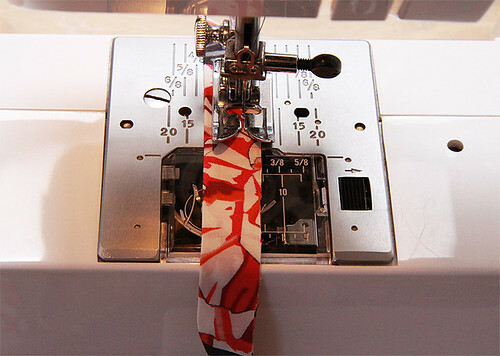 Repeat the shirring a foot width away until you have done 10 rows, or until you have shirred for your desired amount. If you are large busted you may want to shirr more than 10, or if you are making it for a very young child you may want to shirr for less than 10 rows. Figure out what you'll be most comfortable with, and go from there. You will probably need to re-wind your bobbin with more elastic thread every few rows. As you shirr, straighten out the fabric - it helps you keep a straight line. Once the shirring has been completed, insert the desired length of 1cm wide elastic (measure it around the torso to see what length feels comfortable) into the casing at the top of the dress, tacking it to each end to keep it in place. Then with right sides facing sew your other side seam together. I like to sew over the shirred part twice, just to reinforce the elastic thread. We don't want any of them wriggling loose now! Then hem the bottom of the dress. Measure out how long your shoulder straps will be, then cut a two 3cm strips of fabric this length. Folding the strips in two with right sides together, sew close to the edge of the strap. Trim seam allowances, then inside-out the strips. Attach the shoulder straps to the inside of the back and the front of the dress in your desired position. I find with Grumbles that the straps don't slip off her shoulders so much if I cross them over at the back. 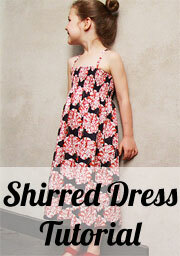 Now pat yourself on the back and do a happy dance - you've completed a shirred dress! I'm so happy to see this post! Ive been wanting to make one of these for myself forever. Thank you!! I was just thinking a shirred dress would be perfect for summer. Do you think that an adult sized version would need more than 10 rows of shirring due to that area being a bit larger than a girl's? Good point, Rachel - I'll amend that in the instructions now! I've never done one of these either, so I might try it. Thanks so much for the tutorial! I'm sure my daughter will want one when she sees your daughters. Shirring is gorgeous. I may try it sometime. 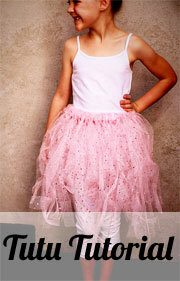 Your little girl looks so gorgeous in her dress. I really enjoy your blog and I must say all the photographs are excellent. Do you take them? I really appreciate your time and generosity in publishing this tutorial. Thanks so much for taking the time to post your comprehensive tutorial! I recently came across your blog and it has inspired me to approach my sewing more confidently as a result. And, I particularly enjoy coming across fellow Australian sewers (I am in Sydney). I have been re-modelling some of my favourite clothes this weekend and used your shirring tutorial to mirror a small square that existed as an accent on the (RTW)sleeves, as a way to cinch in the waist on a too-boxy linen shirt. So pleased with the result - thank you! Oh, that last photo is so pretty. I love her expression, and the balance, color, all. Thank you so much for this Tutorial. You make it sound so easy, even for a beginner like me! I am going to try and make one for my Daughter this afternoon with a bit of Disney inspiration for our upcoming trip to Walt Disney World!. You only need the elastic thread in the bobbin, and you should just use normal thread for the needle. If you have wound the bobbin elastic as tight as you can, and it is still not shirring, then you may need to check the bobbin and needle tensions, and tighten them up a bit. Do a few test runs on spare pieces of fabric, altering the tensions as you go, until you get the desired shirring effect. Thank you for your reply. I realised what I was doing wrong... I had my machine set to short stitches. I lengthened them and voila!! Perfect!!! I was taught to wind the shirring elastic onto the bobbin snugly, but never stretched out. I've always done this by hand and my shirring works perfectly. Thanks so much for this tutorial. The sizing info is fantastic!!! Thank you so much i cant wait to try making one. Leave a comment! Make my day!